Yu-Gi-Oh! Dungeon Dice Monsters is a video game version of Dungeon Dice Monsters for Game Boy Advance. At the beginning of your turn, you throw 3 dice with different icons, each dice corresponding to a monster. If you get two stars with the same level, you can summon a monster, unfolding the dice to create a path on the playing field. The goal of this game is to hit your opponent three times. This is where you see your dice and add / remove dice from your "pool". Here you can face the duelists that you have beaten in the tournaments. Trade with a friend via the GBA link cable. Here you can buy Dice from Yugi’s Grandpa’s game shop. Description: A good place to start off and practice your skills. Strategy: This is pretty straight forward gameplay. Nothing special. Just get to the end as fast as possible using low level dice and summon a level 2 to finish the job. Description: This is another beginner’s tournament. Normal field. Description: This is the second to last tournament in the first group. The field has a water square taken already in the middle. You can’t touch this square when putting down dungeon path. Description: The last tournament in the first group. To get to this tournament you must first beat of the other first round tournaments. The field has two spots which you can’t touch while summoning. They are located four spaces to the right and four spaces up from each duelist’s die master. After you win this tournament you get to see the credits screen. Description: The field has two obstacles located at two squares two the left or right and eight squares up. Description: This course’s two "obstacles" are located: 1) four spaces forward of one die master 2) two spaces up, and two spaces to the right of the other die master. Description: This course’s four "obstacles" are located: 1) 3 spaces forward and 2 spaces to the left of your die master, 2) 9 spaces forward and 5 spaces to the left of your die master, 3) 9 spaces forward and 5 spaces to the right of your opponent’s die master. 4) 3 spaces to the left and 4 spaces forward from your opponent’s die master. Description: This course’s four "obstacles" are located: 1) 3 spaces to the left and 2 spaces forward from your die master. 2) 4 spaces to the left and 5 spaces forward from your die master. 3) 3 spaces to the left and 1 space forward from your opponent’s die master. 4) 5 spaces to the left and 3 spaces forward from your opponent’s die master. Description: This course’s four "obstacles" are located: 1) 3 spaces to the left and 5 spaces forward from your die master. 2) 5 spaces to the right and 3 spaces forward from your die master. 3) 4 spaces to the left and 5 space forward of your opponent’s die master. 4) 4 spaces to the right and 4 spaces forward of your opponent’s die master. Description: To get to this tournament, you have to win all of the other tournaments in the "reverse" division. If you win, you see the credits screen again and you advance to the next level of tournaments. 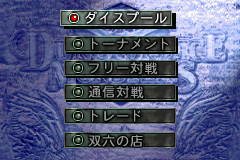 This course’s four "obstacles" are located: 1) 4 spaces forward from you die master. 2) 3 spaces forward and 1 space left from your die master. 3) 3 spaces forward and 1 space right from your die master. 4) 1 space forward and 1 space to the left of your opponent’s die master. Description: This tournament has 12 obstacles, (six on each side). They are located about halfway down the field in pyramids with the base of the pyramids located at the field’s left and right borders. Description: This course’s 12 "obstacles" are located: 1) 5 spaces to the left and 1 space forward from your die master. 2) 5 spaces to the left and 4 spaces forward from your die master. 3) 5 spaces to the left and 7 spaces forward from your die master. 4) 5 spaces to the left and 10 spaces forward from your die master. 5) 5 spaces to the left and 13 spaces forward from your die master. 6) 5 spaces to the left and 16 spaces forward from your die master. 7) 5 spaces to the right and 1 space forward from your die master. 8) 5 spaces to the right and 4 spaces forward from your die master. 9) 5 spaces to the right and 7 spaces forward from your die master. 10) 5 spaces to the right and 10 spaces forward from your die master. 11) 5 spaces to the right and 13 spaces forward from your die master. 12) 5 spaces to the right and 16 spaces forward from your die master. Description: This course’s 5 "obstacles" are located: 1) 3 spaces forward from your die master. 2) 6 spaces forward from your die master. 3) 9 spaces forward from your die master. 4) 12 spaces forward from your die master. 5) 15 spaces forward from your die master. Description: This course’s 5 "obstacles" are located: 1) 6 spaces left and 4 spaces forward from your die master. 2) 3 spaces left and 4 spaces forward from your die master. 3) 4 spaces forward from your die master. 4) 3 spaces right and 4 spaces forward from your die master. 5) 3 spaces right and 10 spaces forward from your die master. Description: This course’s 8 "obstacles" are located: 1) 1 space left and 4 spaces forward from your die master. 2) 2 spaces right and 4 spaces forward from your die master. 3) 5 spaces right and 4 spaces forward from your die master. 4) 5 spaces left and 9 spaces forward from your die master. 5) 2 spaces left and 9 spaces forward from your die master. 6) 1 space left and 4 spaces forward from your opponent’s die master. 7) 2 spaces right and 4 spaces forward from your opponent’s die master. 8) 5 spaces right and 4 spaces forward from your opponent’s die master. Description: The last tournament in the game. To get to this tournament, you must win all of the other tournaments in the Dark division. If you win, you see the credits screen again. This course’s 4 "obstacles" are located: 1) 5 spaces left and 5 spaces forward from your die master. 2) 3 spaces left and 6 spaces forward from your die master. 3) 7 spaces forward from your die master. 4) 5 spaces right and 5 spaces forward from your die master. Description: After winning a certain amount of tournaments, Yami will challenge you. This course’s 9 "obstacles" are located: 1) 5 spaces left and 1 space forward from your die master. 2) 2 spaces left and 5 spaces forward from your die master. 3) 3 spaces right and 3 spaces forward from your die master. 4) 5 spaces right and 1 space forward from your die master. 5) 9 spaces forward from your die master. 6) 5 spaces left and 1 space forward from your opponent's die master. 7) 3 spaces left and 4 spaces forward from your opponent's die master. 8) 5 spaces right and 1 space forward from your opponent's die master. 9) 4 spaces right and 4 spaces forward from your opponent's die master. Most characters in the game are from the Yu-Gi-Oh! manga. A few original characters are added. Since the English manga mostly used characters' names from the Japanese version, while almost all other English media used the names from the English anime, the English version of this game is the only place where English "dub" names are used for many characters. This page was last edited on 28 August 2016, at 20:49.